Mutation of a T-cell receptor (TCR) confers a higher binding affinity to the tumor antigen WT1, increasing T-cell activity against WT1-overexpressing cells without eliciting autoimmunity in a mouse model. A) Schematic of the amino acid mutations in the WT1-specific TCR alpha chain (3D) that increase binding affinity to WT1. 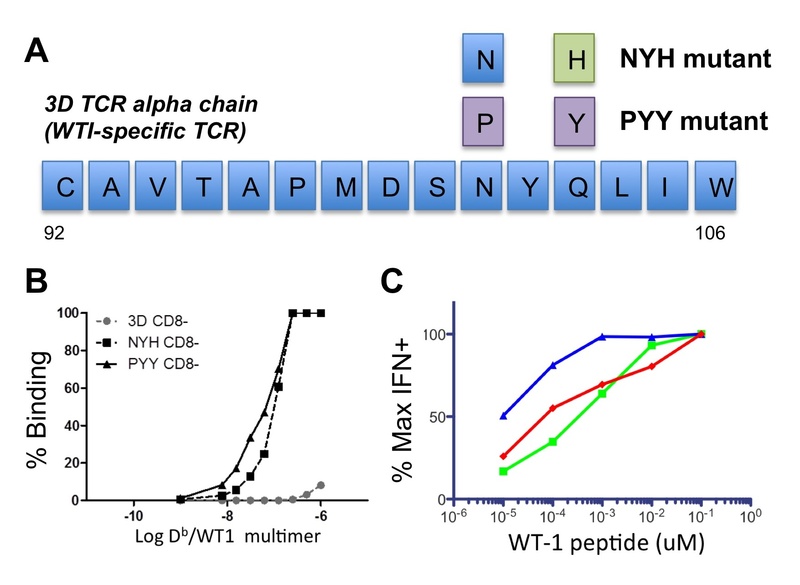 B) WT1 binding affinity is increased for the TCR mutants (NYH and PYY) versus the wild-type TCR sequence as measured by flow cytometry. C) T-cell activation, measured by interferon (IFN) expression, is increased for the high affinity TCR transduced T-cells (PYY blue, NYH red, 3D wild-type green). A novel approach for cancer immunotherapy is to use gene therapy to reprogram patient or donor T-cells to target and kill tumor cells. T-cells can be engineered to express a high affinity T-cell receptor (TCR) that recognizes a tumor-specific antigen. Since tumors are derived from normal tissue, most of the tumor targets for T-cell based immunotherapy are self-antigens. These tumor antigens are expressed at high levels in cancers, but are found at low levels in select cell types in the adult. During T-cell development in the thymus, T-cells are sorted by their relative ability to recognize and react to self and non-self antigens to prepare the immune system to mount a response to any foreign invader while preventing autoimmunity. T-cells that bind weakly to self-antigens are allowed to survive and undergo further development to fight foreign invaders, while T-cells that bind strongly to self-antigens would mount an autoimmune response and are therefore eliminated by the immune system. This central tolerance mechanism limits the ability to isolate naturally occurring T-cells that could bind tumor antigens with high affinity and effectively eliminate tumor cells. To circumvent this problem, T-cell receptors (TCRs) can be engineered in vitro to improve binding affinity to tumor antigens and promote more potent killing of tumor cells. However, tumor-specific TCRs that have been affinity-enhanced beyond the limits of thymic selection have the potential to elicit autoimmunity when used in TCR gene therapy. Alternatively, thymic selection may be overprotective and TCRs with high binding affinity to tumor/self-antigens could potentially be tolerated in the periphery outside of the thymus. To address this hypothesis, postdoctoral fellow Dr. Thomas Schmitt and researchers in the laboratory of Dr. Philip Greenberg (Clinical Research Division) used a mouse model to assess efficacy and safety of gene therapy using enhanced-affinity TCRs for two separate tumor antigens. Wilms’ tumor antigen 1 (WT1) is a transcription factor that is detected only at low levels in a subset of normal cell types, but is over-expressed 10- to 1,000-fold in many solid tumor and leukemia cells. The team isolated a WT1-reactive TCR from T-cells of mice and cloned the TCR into a retroviral vector for gene therapy. They then mutated this WT1-specific TCR to find variants with higher binding affinity using a saturation mutagenesis screen. The researchers identified two of the engineered TCRs that appeared to bind with higher affinity to WT1 in vitro. To test if increased binding affinity translates to enhanced T-cell function, the TCR variants were transduced into T-cell lines and tested for T-cell activation against WT1 antigen ex vivo. The mutant TCR with the highest binding affinity had the highest functional activity as measured by T-cell expression and release of cytokines (see figure). To replicate the conditions of how human TCR gene therapy is performed, cytotoxic CD8+ T-cells were transduced with the different WT1-specific TCRs, expanded ex vivo, and injected into mice. T-cells expressing the enhanced-affinity TCRs were not preferentially selected for or against in the peripheral blood, suggesting they were not responding to WT1 or cross-reactive self antigens. Importantly, enhanced-affinity WT1-specific T-cells did not target normal tissues or elicit autoimmunity, even in tissues that express low levels of WT1 expression. The researchers then asked if tissue damage increased after inflammatory conditions were induced by an external bacterial pathogen. Modified T-cells were transferred into mice infected with a strain of the bacteria Listeria monocytogenes engineered to express WT1 to activate and expand the WT1-reactive T-cells; and, again, the enhanced-affinity TCRs did not direct the T-cells to target normal tissues. Schmitt et al. also asked if the enhanced-affinity TCR genes would be selected against during normal T-cell development in the thymus. Hematopoietic stem cells were transduced with the TCR genes, and the T-cell progenitors that developed from these cells displayed negative selection with reduced function against the WT1 antigen. This study provides support for the hypothesis that thymic selection may be overprotective and TCRs with high binding affinity to tumor/self-antigens could potentially be tolerated in the periphery. To further support the safety of gene therapy with enhanced-affinity TCRs, the authors performed identical experiments with TCRs specific for the tumor antigen mesothelin. The researchers showed that for both WT1 and mesothelin, the enhanced-affinity TCRs can be expressed in T-cells and transferred in vivo without any signs of autoimmunity. In a previous publication, the Greenberg laboratory demonstrated clinical efficacy of using adoptive T-cell therapy with CD8+ T-cells reactive to WT1 in human patients with high-risk post-transplant leukemias (Chapuis AG et al., 2013). "Future studies will focus on testing enhanced-affinity variants of this TCR in a humanized mouse model of TCR gene therapy targeting WT1," according to Drs. Schmitt and Greenberg. If confirmed to be safe, this approach could increase the anti-tumor activity of adoptive T-cell therapy to treat high-risk cancer patients. Schmitt TM, Aggen DH, Stromnes IM, Dossett ML, Richman SA, Kranz DM, Greenberg PD. 2013. Enhanced-affinity murine TCRs for tumor/self-antigens can be safe in gene therapy despite surpassing the threshold for thymic selection. Blood, Epub ahead of print, doi: 10.1182/blood-2013-01-478164. Also see: Chapuis AG, Ragnarsson GB, Nguyen HN, Chaney CN, Pufnock JS, Schmitt TM, Duerkopp N, Roberts IM, Pogosov GL, Ho WY, Ochsenreither S, Wölfl M, Bar M, Radich JP, Yee C, Greenberg PD. 2013. Transferred WT1-reactive CD8+ T cells can mediate antileukemic activity and persist in post-transplant patients. Science Translational Medicine 5:174ra27.